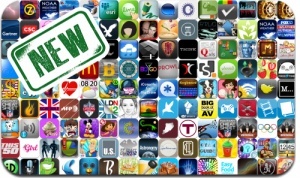 iOSnoops is constantly on the lookout for new apps, and here are 245 iPhone, iPad and iPod touch apps recently released. This new apps alert includes Bon Voyage: Hidden Object, All Talk, Where’s My Perry? Free, Super Slots, All Talk, 10000000, Running Rabbit, The Haunt, Office Politics, Pixel’d, SilentAlert, NFL Fantasy Cheat Sheet 2012, and many others.